"I had to stifle some tears at the horror of the fish tank they were being forced to live in." 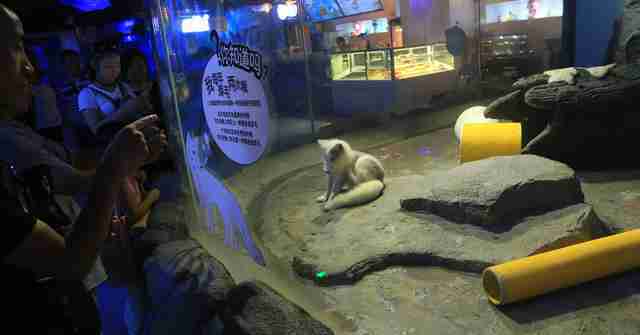 For the past year, the world has been rallying around Pizza the bear, a young polar bear who was first confined to Grandview Aquarium in Guangzhou, China, after it opened its doors earlier this year. 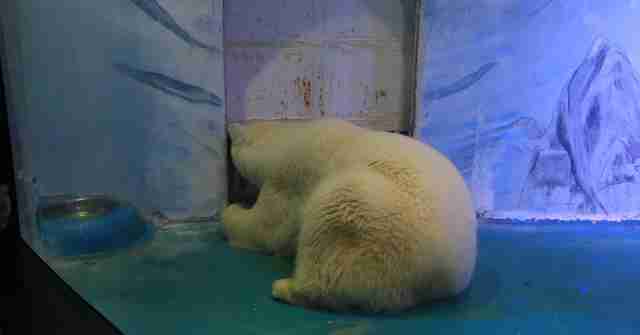 Dubbed "the saddest bear in the world," Pizza was trapped in a gaudily painted blue concrete cell in a shopping mall, with few toys, no sunlight and only a tiny pool to swim in. His large windows looked out onto the throngs of tourists who would visit the mall each day, banging on the glass and filling his cell with relentless camera flashes. Video showed Pizza pacing back and forth in front of his wall, swinging his head violently from side to side - clear signs that he was going crazy from his confinement, according to experts. 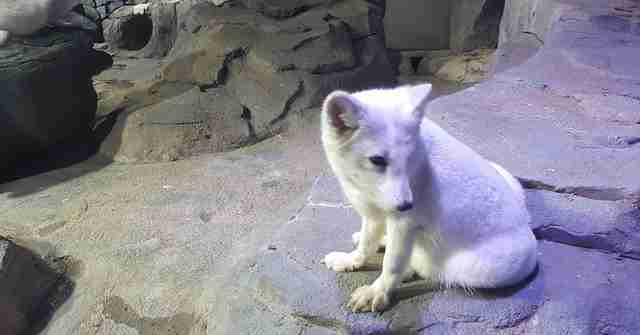 But while his story's a sad one, he's far from the only inmate at the shopping-mall-slash-zoo. 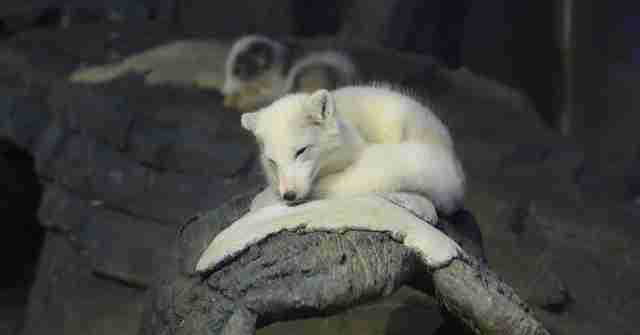 Grandview is home to hundreds of other animals, including Arctic foxes, wolves, walruses, belugas - who do notoriously poorly in captivity - and scores of fish and other animals, including, at one point, a whale shark. And while Pizza has become the face of the campaign to shut the zoo down, most of them are in equally depressing conditions. "I didn't realize so many other animals were also there in such horrid conditions," he told The Dodo, noting that, after passing by the mall's high-end stores, the aquarium's entrance stood out with a "dazzling" spectacle of lights and several fish tanks that appeared to be fairly well cared for. But the entryway was misleading, he explained. "The first sign of inadequate animal husbandry is that of a Myna bird in a cage so small it cannot even stretch its wings, let alone fly," Foster said. 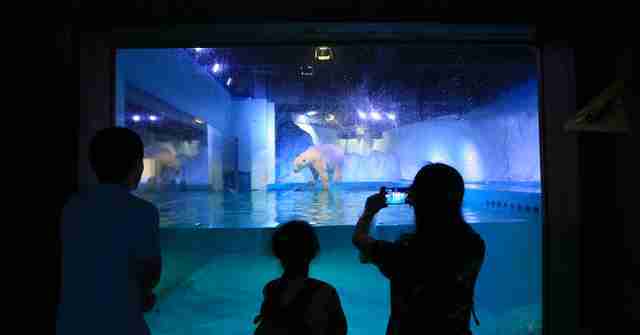 Once inside the aquarium, it got worse - particularly at the beluga exhibit. "Once you enter the area of the beluga whales it all changes much more drastically," Foster said. 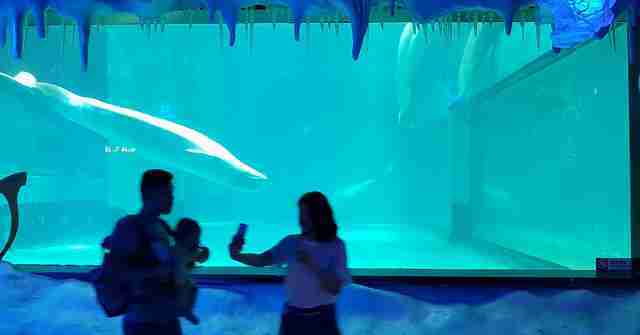 "I physically took a step back at the pitiful sight of beluga in a tank so small they were almost physically longer than it was tall." 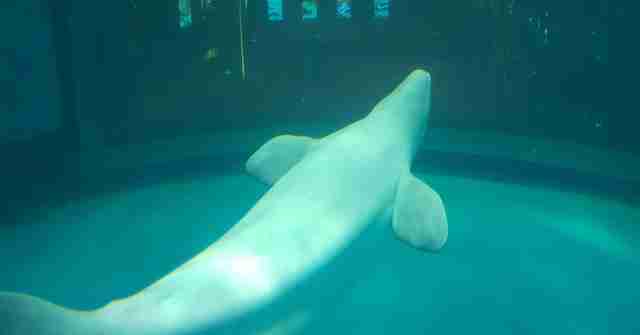 Belugas are infamously difficult to keep in captivity. At SeaWorld and similar facilities, they've been documented fighting each other out of stress and displaying stereotypic behaviors - patterns of repeated behavior animals develop to cope with the discomfort of captivity. They often die decades earlier than their natural life spans. 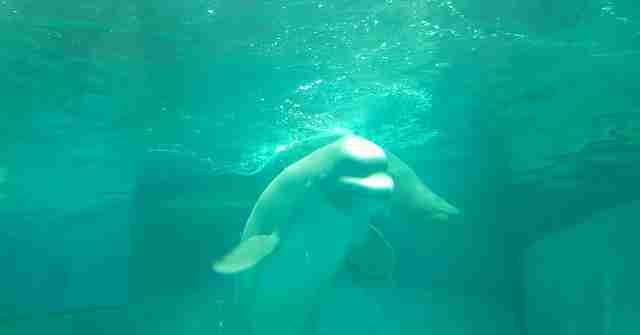 The Grandview belugas displayed signs of both aggression and stereotypic behaviors, Foster said. "A sexually frustrated male was harassing another whilst the rest blew bubble rings to swim through, probably just to relieve their boredom," he noted. The walruses faced similar conditions - and also had barely enough room to turn around in, according to Foster. "The walrus[es] are in a pitiful state," he said. 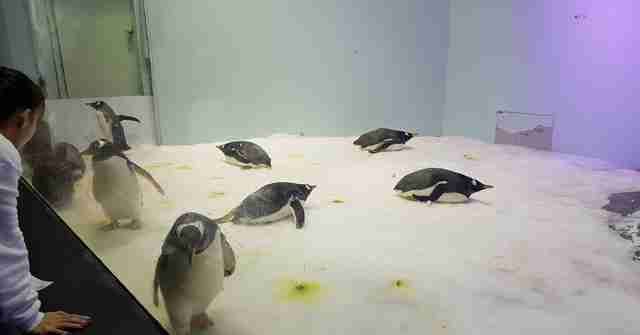 "Their miniscule and dirty tank is only 2.5 times their body length and not even wide enough to stretch fully. I turn a corner to find another walrus being used as part of a circus act. I can hardly stomach anymore [at this point]." 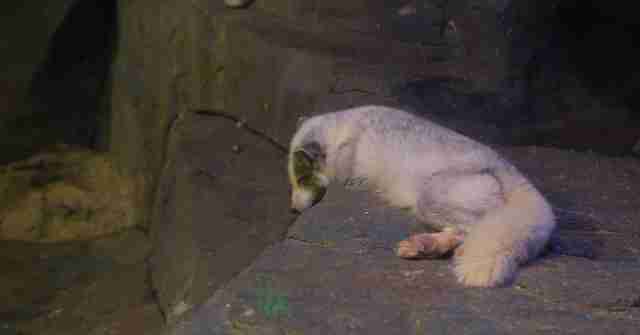 But it's not just marine mammals who are suffering. 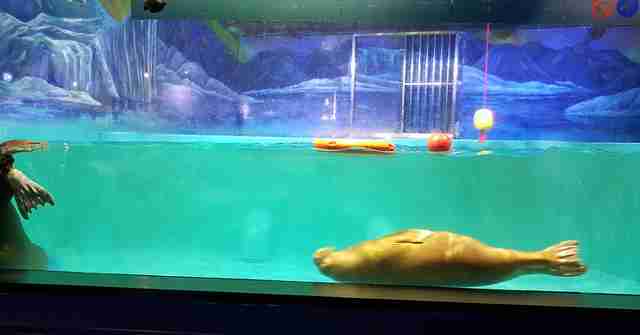 There are several land animals at the aquarium, like Pizza, who live in the same dark cells, devoid of natural sunlight and fresh air. 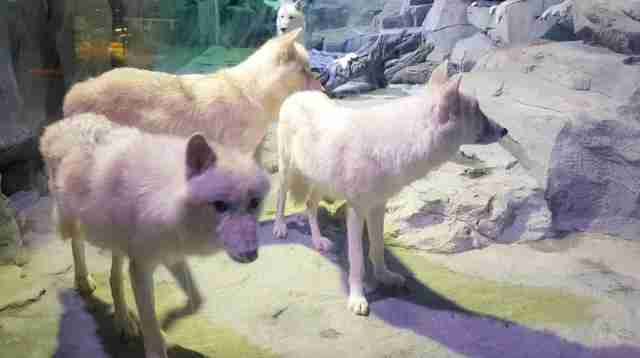 The condition of the wolves was particularly bad, Foster said. "I had to stifle some tears at the horror of the fish tank they were being forced to live in," he explained. "No horizon or sky to look at, stimulus reduced to zero with nothing to smell or dig in. I was aghast." 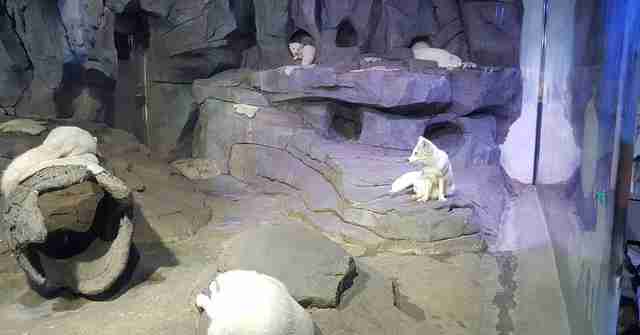 A group of Arctic foxes is kept nearby. 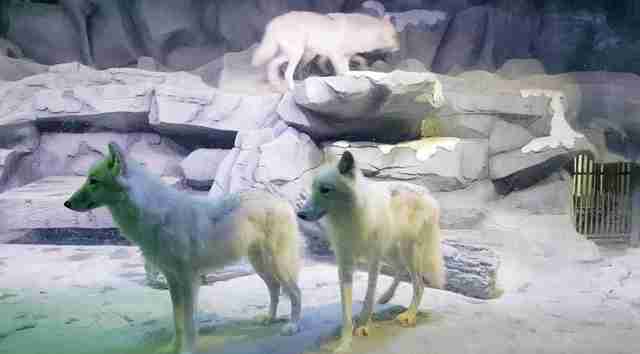 While their room is bigger than the wolves' area, they live on the same gaudy concrete and have few toys or sources of enrichment. 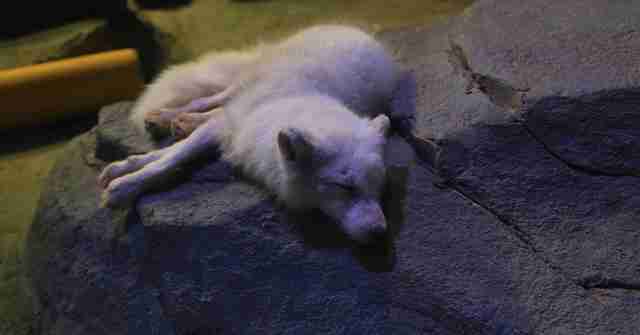 "The Arctic foxes ... lay around calling to one another," Foster said, noting that although they weren't displaying any immediate signs of stress they were "clearly bored." And of course, there's Pizza - the bear whose plight has become the face of outcry against Grandview. 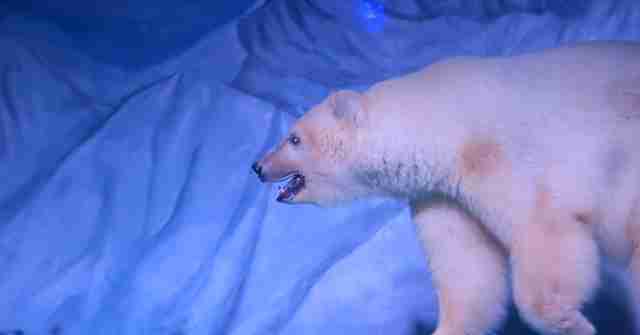 "It was immediately clear that [he] has obvious psychological stress," Foster said about the polar bear. "Every footstep hits the same repetitive mark, [his] head sways at every turn. In a few short strides [he] has completed the full length of [his] glass-walled prison." Since Foster's visit, life may have gotten better for at least one of Grandview's animals. Last month, officials at Grandview announced they were temporarily relocating Pizza to the undisclosed marine park where he was born, and where his parents reportedly still are, while some of the facilities were being upgraded. Yet it's unclear if he was actually moved - and if so, where he ended up. Some critics speculated that Grandview was simply trying to remove Pizza from the public eye due to his declining state. "Our video clearly showed that Pizza was suffering, and we warned the mall that soon his decline would be so apparent that it would be difficult to have him on public display," Peter Li, China policy specialist for HSI, said at the time. "Without a doubt, the mall has had to act due to tremendous pressure from Chinese and international campaigners, but I fear that Pizza's poor health is part of the reason too." 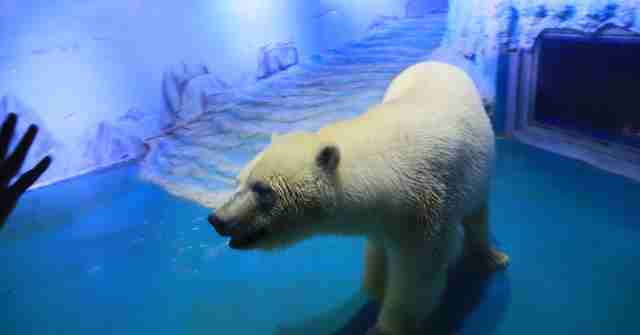 Yet advocates are hopeful that, whatever Pizza's fate, the young polar's fame will ensure that his well-wishers around the world don't forget the dozens of other animals who are faring just as poorly at the infamous zoo. "I'm brimming with anger," Foster said of his visit. "It has stuck with me since and I pray that this place is brought to a quick close." If you'd like to help the animals at Grandview, you can make a donation through HSI. 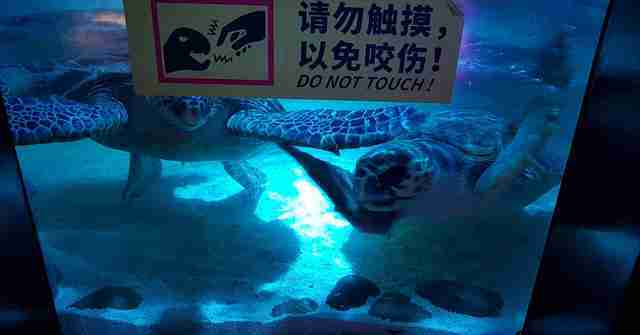 You can also add your name to petitions calling for the aquarium to be shut down here, here and here.